Kids of all ages will love this large gift basket overflowing with activities, books, gifts and all sorts of "kid-favorite" goodies! It is a can’t miss gift for birthday, get well, Easter, or just about any occasion. If "Wow!" is the response you are hoping for, than this is the perfect choice for the child on your gift list. 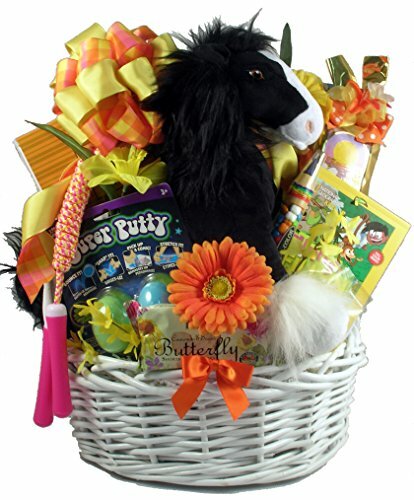 This fun and fantastic gift basket will be received with sheer joy. It offers a host of child favorites - toys, activity books, story books, games, sweets and snacks and a of course, the over-sized, soft and beautiful Disney horse that will surly be their new forever friend! How can you go wrong with a gift like this for Easter? This special gift features "Angus" the beautiful stallion from The Disney Movie "Brave". This Licensed Disney Horse will be a treasured friend for years to come.